Our services are available in the Silver Spring and surrounding areas 7 days a week. Services range from a few hours a day to 24/7, live-in care. Georgetown Home Care provides services for adults (18+) in private homes, assisted living communities, hospitals, skilled nursing facilities, and rehabilitation centers. Our Silver Spring-serving office is just 20-minutes away in Chevy Chase, MD. To get to our office, you can choose a couple different routes: You can choose the direct, quicker route which takes Beach Road through the Rock Creek park area. Immediately out of the park area, you’ll take a left onto Pinehurst Parkway and then a right onto Western Avenue. Stay on Western Avenue through Chevy Chase Circle and then take a right onto Wisconsin Circle. Alternatively, you can take East West Highway (410) to Connecticut Avenue (185 South). 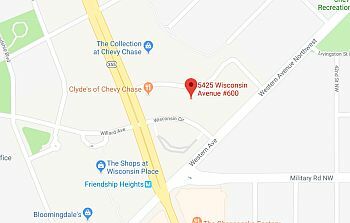 At Chevy Chase Circle, you’ll take the third turn onto Western Avenue and then turn right onto Wisconsin Circle just a half-mile down the street. This route has fewer turns but typically takes about 5-minutes longer.